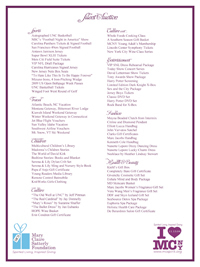 Inaugural Fall Gala & Silent Auction | "MCSpirit!" 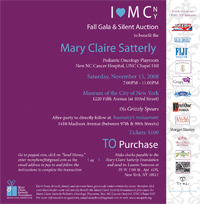 On November 15, 2008, over 600 of Mary Claire Satterly's friends, family, co-workers and guests gathered at the Museum of the City of New York in Manhattan for the Inaugural I ♥ MC-NY Fall Gala and Silent Auction. The Gala was a Celebration to benefit the Mary Claire Satterly Foundation and raise money for the Mary Claire Satterly Pediatric Playroom at the new N.C. Cancer Hospital. Over $90K was raised towards the Playroom from this event. The event was hosted by friends, family and corporate sponsors --and all attendees were welcomed by someone who knew or loved Mary Claire. At 9:30pm, MC's friends and family thanked guests from the Museum's regal staircase, which looked out on the Museum's marble floors packed with young, bright faces. After the Committee recounted some of their wonderful MC-NYC memories, described the MC Playroom set to open in 2009, and presented a check for $100,000 to Lineberger towards the Playroom—the entire party toasted to "MCSpirit!" The memorable evening included Carolina blue ribbons worn by the event hosts and a Silent Auction categorized by Mary Claire's interests and pastimes. These themes included Health and Beauty, Travel, Children, Fashion and Beauty, and Sports. All guests received a gift bag with event logo and included a special letter and promotion from Serena and Lily and I ♥ MC-NY Koozies, among other wonderful contents. Guests enjoyed specialty drinks including Ketel One martinis, champagne, wine, and personalized Sweet Water "MCSpirit!" Ale. The food served was Bill's BBQ, Blue Smoke deviled eggs, sushi, and Cupcakes, which were all "MC favorites." Music was provided by DJ Grizzly Spears. The museum's exhibit "Paris/New York: Design, Fashion, Culture 1925-1940," "Catholics in New York," and "Photographs are Eudora Welty" were open for private viewing, reflecting MC's Fashion, Faith and Southern roots. Classic white roses with aborigine flower accents were arranged by MC's Godmother and dear friend.